I can’t believe I’ve gone this long without going through the rite of passage that is the Flickr api Flex app. Well, here it is. I’ve created a new component that extends ViewStack that does the “photo shuffling” effect when you change photos here. I’ll be releasing the source code eventually (at least for the custom ViewStack component), maybe I’ll develop it a bit more and add it to FlexLib. The main component is a ViewStack, I just overrode the setter for selectedIndex. That entire extended ViewStack component is under 100 lines of code. A search for “monkey drinking beer” comes up with a series of pretty amazing photos. View the app here (or click the screenshot below). Pretty sweet logo, whoever designed that must be pretty much the best person in the world. Get your 360|Flex stuff here. And if you haven't registered for 360Flex, do that here. Very cool app, cant wait for the source. 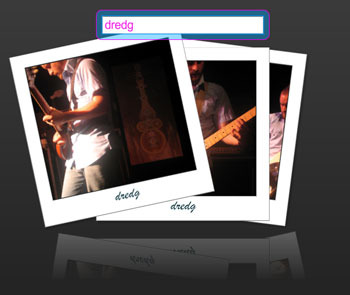 It’s even cooler that you like dredg. Sweet app! Great job, Doug. Very slick, and I’m looking forward to seeing source on this one for sure. I did notice though that the label on the next picture bobs around a bit when the pictures are moving around to the left, but not to the right. Kind of strange, anyhow, awesome work! What does a PHP proxy have to do with image reflections and smoothing? Great work. Since the images are located on a flickr server like farm1.static.flickr.com and there is no crossdomain.xml file on that server (there is a crossdomain.xml for api.flickr.com so you can use the api) that means you can’t get access to the bitmapData of the loaded images when you load them from flickr. This is dumb, but that’s the way it is. So you can load images just fine, but the reflection class copies the bitmapData of the image, so that doesn’t work if you load them straight from the flickr server. I also wanted to set bitmap smoothing to true on the images so the thumbnails don’t look as pixelated, and that also requires access to the bitmapData of the loaded image. So the answer is to create a proxy that loads the flickr image so it appears to come from the same domain. Love the smooth look and feel. Nice work, Doug. S.
I particularly like the viewstack. Look forward to seeing it in flexLib. Any thoughts on when it might make it in there? And thanks for posting so much cool stuff by the way. Doing it this way is better, because having your server act as a proxy for Flickr eats up your bandwith and kills the whole point of putting your images on Flickr instead of your own server. By the way, I am using the Flex Builder 3 beta. I think the example on that site was for flash, so I only used the script, and I also imported mx.core.BitmapAsset, but I’m not sure if that was necessary. I don’t think you tested the smoothing technique (http://blog.739saintlouis.com/2007/02/05/scaling-an-image-with-smoothing/) on a web server. I tried this method thinking to myself, why would it work just because you smoothed the image? It does not work, its kind of like grinding down bananas and smoking them in a pipe, you same advertised “high” effect. If you test anything locally, Flex will not give you any errors, but post the same application to the web, and you will find the sandbox violation staring you in the face. The only way to get by this error is to proxy the image. If you have a working app and code on a serve, I would love to be proved wrong. Can anybody help me port this PHP proxy script to Perl? My Perl is not very good but thats what I have to use and I do not want install PHP as well on this server I am using. I am actually not using this for Flickr files but rather just for loading a tiny piece of data from another server. Any chance you’re going to a) release the source and/or b) update this to not use a bitmap proxy? I’d love to clean it up & put it on riaforge or something if you don’t have the time. So tell me. What’s their real height? Good article.